Periodontitis (loose teeth) is a disease that affects the tooth-supporting tissues. It must be treated by specialists called periodontists. Successful treatment of periodontitis requires collaboration between the patient, periodontist and hygienist. Periodontitis is a disease that affects the tissues surrounding and supporting the teeth in your mouth. Damage to these tissues can lead to pain, bleeding gums, loose teeth and even tooth loss. Periodontal disease – loose teeth – is the leading cause of tooth loss in adults. Almost 75% of adults suffer from some form of gum problem over the course of their lives. But the disease can also affect young people. Smoking, stress and poor dental hygiene can cause loose teeth. Discover here our video about periodontal disease. There are several stages in the development of gum disease. The initial stage is called gingivitis. This only affects the gums and is characterised by inflammation: the gums bleed and become red and swollen. The gums may become painful, for example, when you brush your teeth. If gingivitis is not treated, the inflammation may spread to the surrounding tissues, such as bone. Bone surrounds your teeth and holds them in place in your jaw. If nothing is done, the bone, ligaments and all the other tissues that support and surround your teeth will gradually become damaged and could result in the loss of one or more teeth. This is what is called periodontitis. 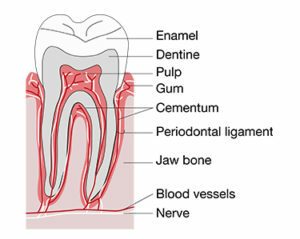 Your teeth are rooted in bone, which holds them in place. Other tissues that surround the bone also help to keep your teeth in your mouth: ligaments, gums and cementum. We call these tooth-supporting tissues. To prevent gum inflammation and loose teeth, we recommend cleaning your teeth every day. By using a manual or electric toothbrush and other accessories like dental floss, picks or interdental brushes daily, you can prevent the build-up of plaque and tartar on your teeth. Regular scaling by a dental hygienist is also recommended to remove any stains from your teeth and plaque build-up in areas that are hard to reach. Good dental hygiene prevents the build-up of plaque and tartar on your teeth and helps to stop the spread of harmful bacteria. Regular visits to your dental hygienist will also ensure good oral health. They will remove tartar that builds up on the surface of the enamel and give you tips for keeping your teeth and gums healthy.